Aedas has launched its new office in Kiev, Ukraine, and unveil designs for an exciting new hotel. 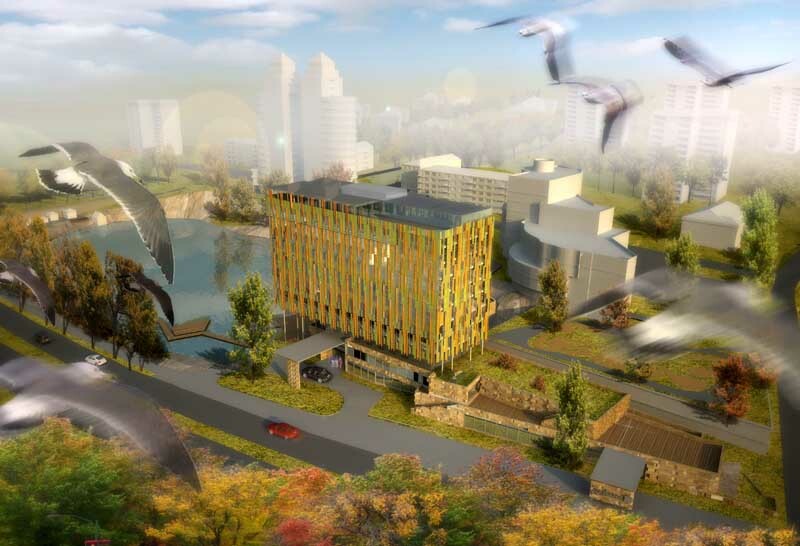 The new designs are for a 185 room, four-star Zaporozhe Radisson Hotel located alongside the river Dneipr. Designs for the hotel have resulted in a functional and visual connection with an existing car park. Inspiration for the scheme has been drawn from the neighbouring granite quarry, which is has been transformed into an attractive pond surrounded by Willow trees. Connection to the surrounding urban grain has been further enhanced with the incorporation of a footpath, creating a communication between building and its immediate environment. The guestroom floors are arranged above a simple form, whilst the façade is delicately textured to allude to the surrounding textures of willow trees. Granite has been specified for both the elevation and podium cladding. Aedas has provided the architectural solution in response to client, Q-Tec’s, brief. The building will incorporate a hotel, conference rooms, a gymnasium and a 600sqm. Paulaner restaurant. Zaporizhia (aka Zaporozhye) is a city in south east Ukraine, on the banks of the Dnieper River. The practice has also opened new premises in Moscow, Russia and two offices in Kazakhstan.